Fiáin co-founder, lover of all things well made. 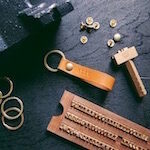 The super chains may have the upper hand when it comes to mass production, but one thing they simply can't do, is customise & make that item personal to you. That takes a special hands-on approach that big box stores can't afford. Craft makers thrive on the one-to-one connection they forge with their customers. Marking, stamping or engraving their purchase is just one of the added benefits of buying through boutique e-commerce stores & their pop up equivalents. 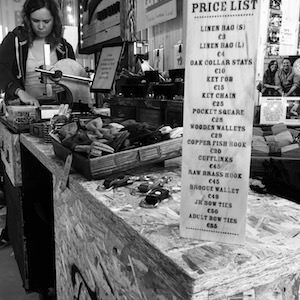 We saw first hand the power of personalisation when we attended the Dublin Flea of Dec,2018. 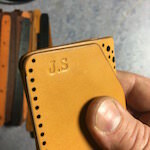 Customers absolutely loved the idea of being able to custom stamp a name or monogram into our line of leather goods. Throughout the day we would spot our branded gift bags being toted around the place & I have to say, that made it extra special for us. The cuff links were exquisite and made really special by the engraving of my husband's initials on them. A product that screamed quality.Well done Caitriona and Dara.. It's not just that the perceived value of an item is increased through a personal mark. It does more then that, personalisation is a commitment to quality & uniqueness, which is more than we can say for the disposable fast fashion of the last decade. It harks back to a time when craftsmanship was valued, & pride of ownership was advertised. We're seeing a resurgence in these lost values, evidence of a thriving craft sector in Ireland. If personalisation is available, the option will be included on the product page. Type in the name or initials you would like imprinted. Personalisation by brass stamps are all upper case. Follow the promts on maximum/minimum letters allowed. We'll do the rest! Although we have our own laser machine, we tend to use this mostly for cutting, prototyping & the personalisation of any of our wood products, such as the wooden wallets & bowties. 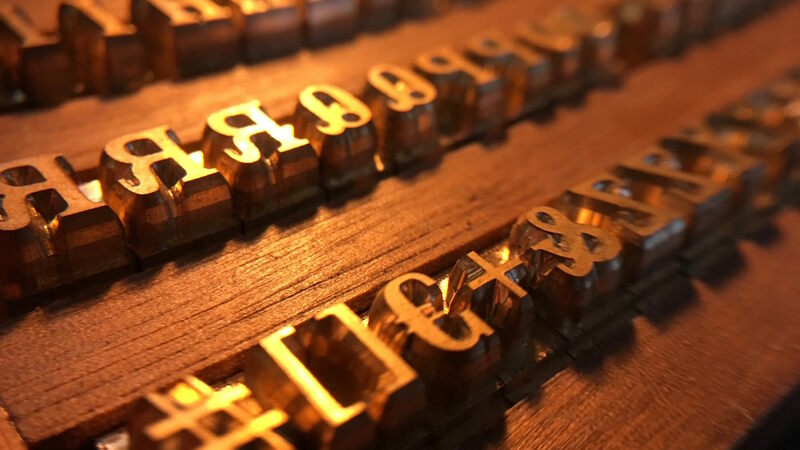 We love the tactile nature of physically stamping names & initials with our own custom brass alphabet (very satisfying), it's also a tad lighter than the laser machine to bring along with us to pop up events! 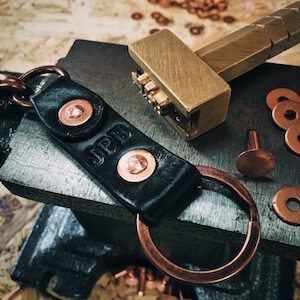 So, you can expect to personalise our very popular leather cufflinks, leather key fobs, leather key chains & hand stitched leather card holders, all made right here in our Galway workshop. 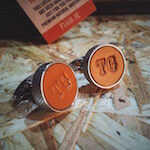 Some items obviously can only take a few letters, such as the cufflinks, but let me assure you, they look awesome when stamped. As do the others, but the cufflinks were the very first product we started to brass stamp & I suppose we have a particular fondness for them! What a fab little gift. These mighty key fobs are available in 3 colours. A low cost but high quality gift. Add your name or monogram for free. Hand stitched Italian leather goodness! Our gorgeous card wallets can be personalised for free with a monogram in the top left corner. Pictures don't do them justice. You'll see why customers come back time and time again for these stunners! Add 2 x initials per cufflink for free. So go ahead, make an impression, in more ways then one. Make it an heirloom to be proud of, pass it on to the next generation. And don't forget, all of our customisation is free of charge*. You can also laser engrave your name on the wooden wallets & back of our wooden bow ties. Personalisation obviously takes a bit of time to do right. It may add an extra day to our normal dispatch times, but we'll do our best to get everything out in a timely manner. *Customisation type & placement is at our own discretion. For the most part we are engraving/stamping initials and first names only. Personalisation is a wonderful way of gifting something truly unique to yourself or a loved one.